Having taken my 1934 2-seat PD Tourer on various camping/touring holidays, I have found that space is a problem. So I designed a simple, but very effective luggage rack, which is very easily fitted to the spare wheel of the car. The requirements for the luggage rack were that it would be light weight, easy to construct, easy to fit, did not look like a dog’s dinner and most important as economical as possible. The idea came from looking a bike rack. 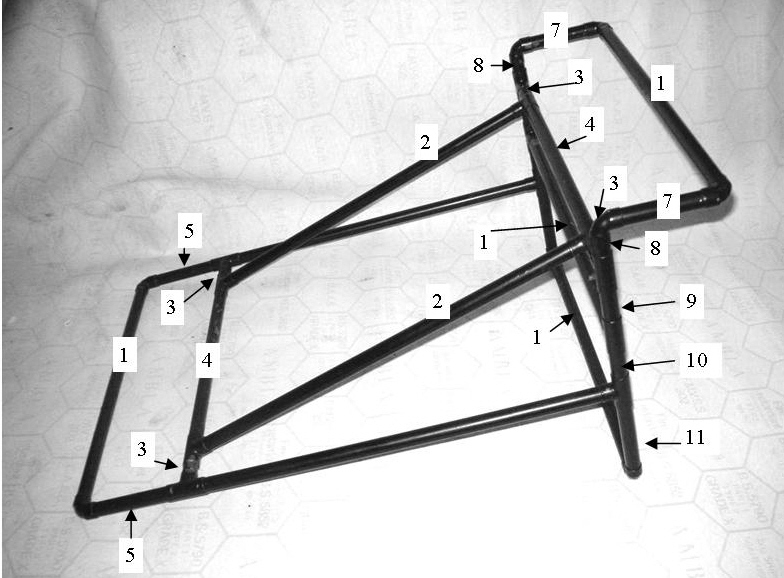 This is the type that slips over the wheel and is attached by a simple ratchet strap system, unfortunately the pipe diameter on these racks are too thick and would [possibly] touch the bodywork, but the big down side is they cost around £70.00 and would need to be cut to suit [so out of the question]. Having just made improvements to the bathroom I found the ideal solution would be15mm diameter copper tube, as used in domestic water pipe/central heating and can easily be joined with the Capillary type (end feed) tee of elbow fittings. The Yorkshire or solder ring types are too expensive and don't look as nice. The copper tube is light weight and the joints can be easily soldered together, and once constructed the frame is very strong, the whole thing takes a few hours to make and is well worth the effort and cost, approx £15 - 20. This design can be adapted to suit say a Box saloon /Chummy where the wheel is on the outside. 1x Small gas blow torch. This article, written by Mike Davies, originally appeared in CA7C Seven Focus in Feb 2007 pp24-25.